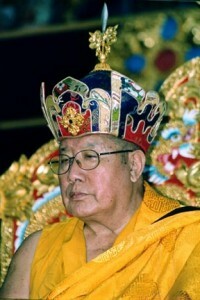 His Holiness Pema Norbu Rinpoche (Penor Rinpoche) was the 11th Throneholder of The Palyul Lineage of Nyingma. One of the foremost masters of the Buddhist tradition of Tibet, he served as the Supreme Head of the Nyingma tradition of Tibetan Buddhism for over ten years. He was considered the reincarnation of Vimalamitra and living embodiment of Vajrapani. Throughout the Buddhist community he was respected for his vast knowledge and accomplishment and for the integrity and strength with which he upheld the Buddhist teachings. His Holiness attained Parinirvana on March 27, 2009. In the beginning of 2014 the reincatnation of H.H. Penor Rinpoche has been found in Tibet. 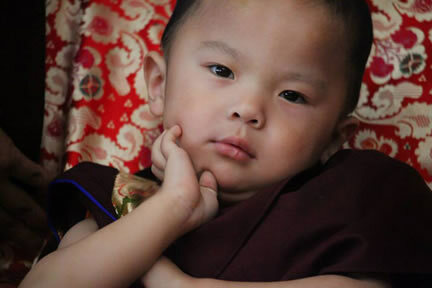 According to His Holiness Jadrel Rinpoche’s prophecy letter, Penor Rinpoche’s Yangsi (reincarnated being), was born near Leten Tramo Drag or Dung Lung Tramo Drag, the sacred place where the Nyingthing Yabshyi (The Four Cycles of Heart Essence Teachings) was revealed. Based upon this prophecy letter, combined with pure visions of Tulku Thubten Palzang Rinpoche, the Yangsi was authentically recognized. On 31st July 2014, the auspicious day of the Buddha’s First Turning of the Wheel of Dharma, the 4th Day of the Sixth Tibetan month–2141 Royal Year– the Enthronement of Kyabje Drubwang Penor Rinpoche Yangsi at Palyul mother monastery in Tibet was held.